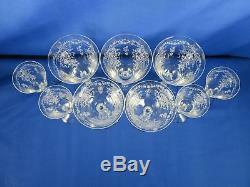 Vintage Fostoria Crystal Stemware Romance Pattern 2 Champagne/4 Cordial/3 Wine. 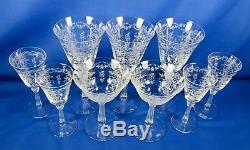 BEAUTIFUL VINTAGE FOSTORIA CRYSTAL STEMWARE!! This Set of Nine pieces is sure to be a delightful addition to any entertainer's collection. This gently pre-owned set of stemware in the Romance pattern is priced to sell. This set is in fine vintage condition showing no chips or cracks. There are some scratches on the base of some of the pieces. The 2 Low Champagne/Sherbert measure approximately 5.5"H x 3.75"W at mouth x 3.0W at base. 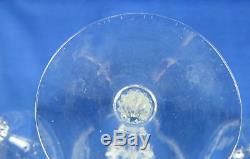 The 3 Wine/Water Goblets measure approximately 7.5"H x 3.5"W at mouth x 3.0W at base. The 4 Cordials measure approximately 5.5"H x 2.5"W at mouth x 2.25W at base. This would make a nice gift for your favorite hostess or for yourself. Make sure to get this lovely set for your collection today and entertain in style!! We sell many different items and cannot be an expert on everything we sell and don't claim to be. We try to describe every item to the best of our ability and knowledge. Thank you for choosing Munchel's Fine Jewelry! If you have questions please message us and we will be happy to assist you! We are located at 3227 S. We do not mark merchandise values below value or mark items as'gifts' - US and International government regulations prohibit such behavior. Our address: Munchel's Dept. 3227 South Florida Avenue, Lakeland, Florida 33803. The item "Vintage Fostoria Crystal Stemware Romance Pattern 2 Champagne/4 Cordial/3 Wine" is in sale since Friday, March 02, 2018. This item is in the category "Pottery & Glass\Glass\Glassware\Elegant\Fostoria\Etched Patterns".com" and is located in Lakeland, Florida. This item can be shipped to United States, Canada, United Kingdom, Australia, Japan, China, South Korea, Indonesia, Taiwan, South africa, Thailand, Hong Kong, Ireland, Israel, Mexico, New Zealand, Philippines, Singapore, Saudi arabia, United arab emirates, Qatar, Kuwait, Bahrain, Malaysia, Brazil, Chile, Colombia, Costa rica, Dominican republic, Panama, Trinidad and tobago, Guatemala, El salvador, Honduras, Jamaica, Antigua and barbuda, Aruba, Belize, Dominica, Grenada, Saint kitts and nevis, Saint lucia, Montserrat, Turks and caicos islands, Barbados, Bangladesh, Bermuda, Brunei darussalam, Bolivia, Ecuador, Egypt, French guiana, Guadeloupe, Jordan, Cambodia, Cayman islands, Sri lanka, Macao, Martinique, Maldives, Nicaragua, Oman, Peru, Pakistan, Paraguay, Reunion.